The lab provides a state-of-the-art testing facility for research focused on laboratory testing as well as for research complementing the ever-expanding field research efforts of CEER. 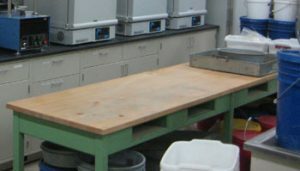 The Geo-Construction Laboratory is located in Room 42 of the Town Engineering Building on the Iowa State University (ISU) campus. 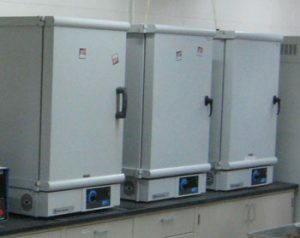 The lab was established in 2005 to support ISU’s research needs. The lab is equipped with a variety of geomaterial laboratory testing equipment and houses most of CEER’s in situ testing equipment. 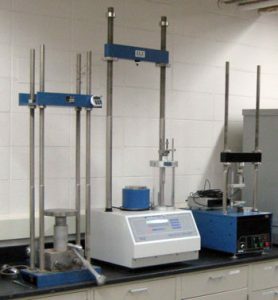 The lab has a number of testing and sample preparation devices unique to ISU, such as the 2×2 sample device, aggregate compaction mold permeameter, and horizontal permeameter devices. The lab also has a 5 ft x 7 ft x 5 ft deep soil test pit. This pit is equipped with a load frame designed to support up to 65,000 pounds of reaction force. Better understand the engineering properties of soils and geomaterials that relate to highway construction performance and that have a high degree of reliability for agencies and contractors. Develop improved laboratory and field testing technologies and procedures for verification testing. 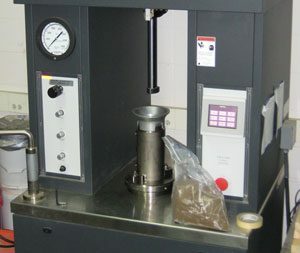 Test the properties of soils and geomaterials that relate to performance and use this knowledge to develop methods of quality control/quality assurance (QC/QA) for geotechnical applications.